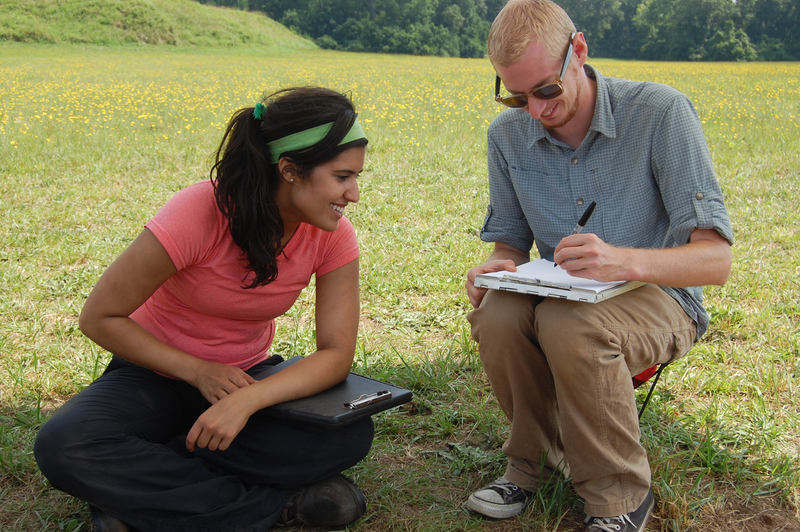 Our days at Moundville have now become routine, but the same cannot be said for our discoveries. Even after a Monday cancellation due to summer storms, the MPP had a productive week full of exciting finds. Matt Colvin shows Sophia Fazal how to fill out a photo board. With its thousands of yellow wildflowers, Moundville’s plaza is particularly picturesque at present. 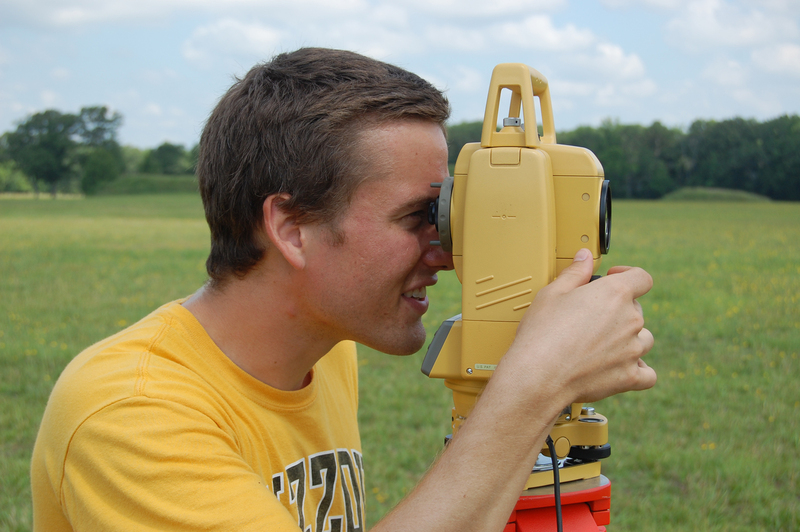 Dan Salberg operates the total station, an electronic/optical instrument that we use to plot the locations of our excavation units and the prehistoric features within them. Team 1 has just about finished excavating all of the features from their first 1-x-2 meter unit: two parallel wall-trenches and two large postholes. Team 1 is now focusing its energy on a second unit that has already exposed what we think is the edge of a rectangular building with a floor area of approximately 900 square feet (9-x-9 meters, as judged from its magnetic signal). A large posthole intruding one of our wall trenches. Archaeologists are able to reconstruct a chain of events by examining the order in which features were made. Team 1’s second unit uncovered the edge of what we believe is a massive square building. 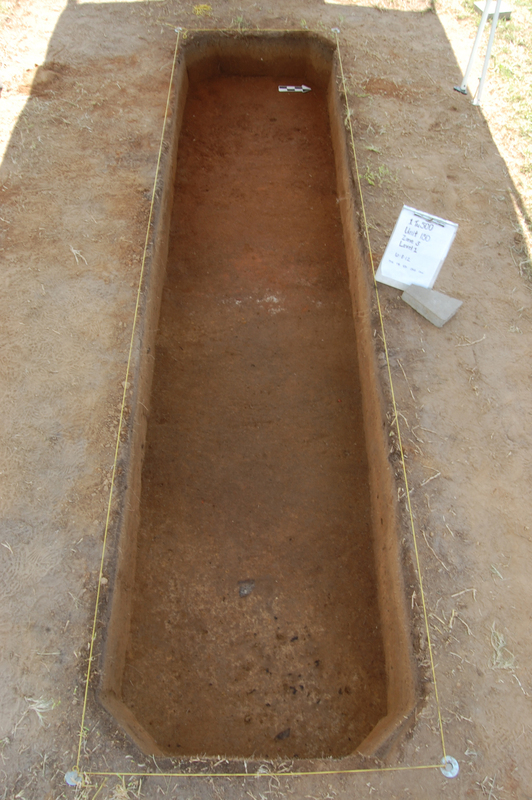 The yellowish brown soil in the lower part of the photo is what remains of the structure, while the red soil in the upper part of the photo is unmodified subsoil. Team 2 has exposed the original floor of a rectangular pit house. Incised designs on the fragments of pottery that they have recovered suggest that this ancient house was built onto the freshly made plaza surface about 750 years ago. While clean-trowelling the floor of this structure, Team 2 noticed a well-defined oval stain. 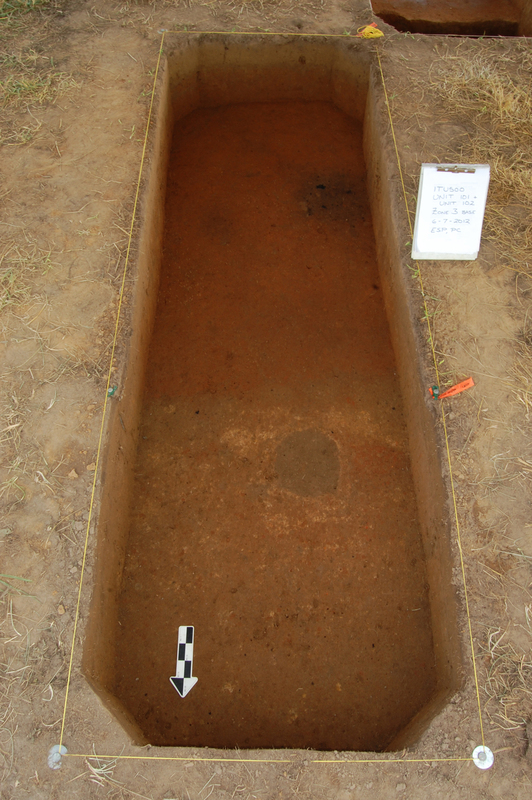 After four days of constant excavation, we now know that this was the top of a bell-shaped storage pit, the first of its kind ever found at the Moundville site. This is an important and unexpected discovery. 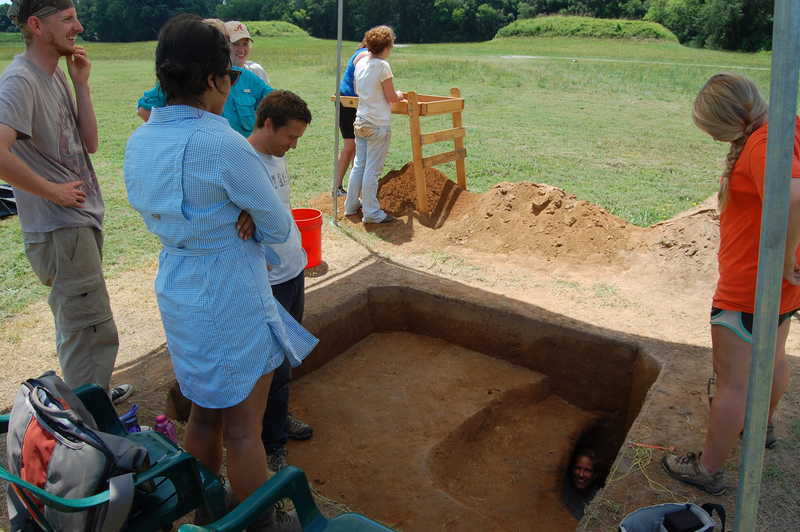 Bell-shaped pits are typical of the hunter-gatherer-horticulturalists who inhabited the Black Warrior River valley in the centuries before agriculture. These people moved from place to place on a yearly round. Along the way, they sealed acorns, hickory nuts, and other comestibles in these roomy storage pits in preparation for their eventual return. The pit we’ve found was lined in fine yellow sand and clay, a measure taken to preserve the foods once kept inside. Soil samples from this pit will be processed and analyzed by a specialist who can identify just what kinds of foods were stored here. So what does it mean to find a hunter-gatherer style pit at one of the largest agricultural centers of the pre-Columbian Southeast? Here is one possibility. Moundville was a cosmopolitan center, a Native American “cathedral” of sorts that would have attracted many kinds of people. 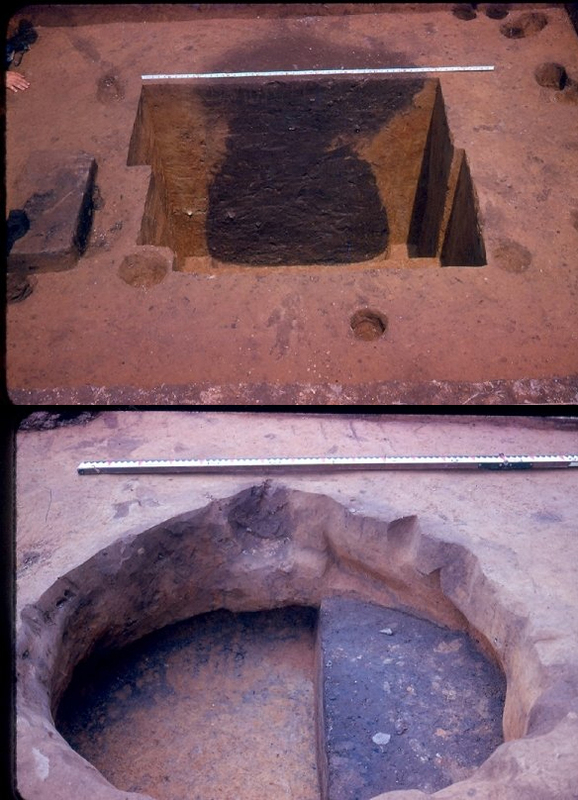 When it was first occupied, the agricultural and sociopolitical revolution of the early Mississippian Southeast was in full swing, yet in that otherwise transformative cultural context some things were slow to change: how to build a house, make pottery, and dig a storage pit, for example. Of the various traditions brought to early Moundville, it was those removed from the public eye – and, thus, from the broader conversation of how things “should” be done – that would have been most resistant to change. This bell-shaped storage pit in the corner of a private home may have been made and used by a family of farmers who, despite the newer fashions of their neighbors, continued some of traditions of their hunter-gatherer ancestors. We’ve excavated only about a quarter of the bell-shaped pit (enough to tell what it is) and yet crew members can nestle inside with ease. In the lower left corner of the picture, Elizabeth Davis is peeking out. We’ll be donning headlamps this week as we continue to excavate this surprising feature. There is talk of caged canaries, as well. 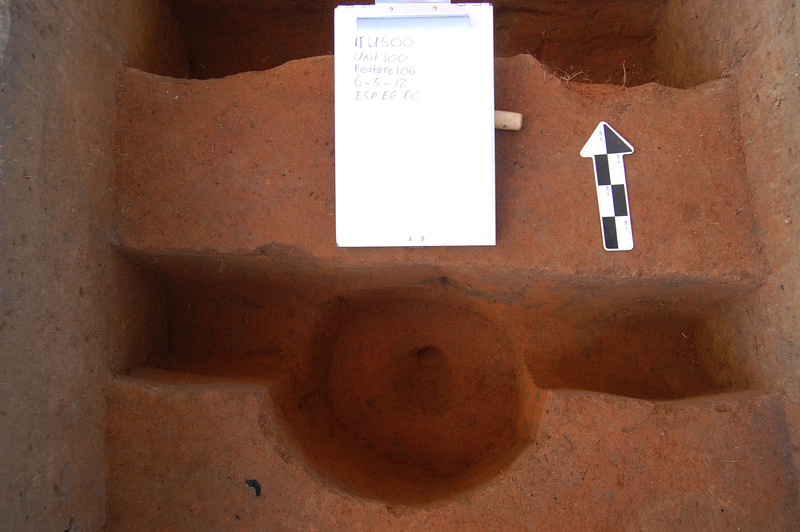 Two bell-shaped storage pits from Ned Jenkins’ West Jefferson excavations. Ours is more similar to the lower example, in that it exhibits a pronounced lip below which the pit sharply expands. We broke new ground this week with a fourth team: Clay Nelson, Emmalea Gomberg, Elizabeth Davis, and Traci Roller. They opened a 1-x-4 meter trench that crosscuts the edge of an enormous circular cluster of magnetic anomalies. I’ve been itching to find out what caused this eye-catching feature of the magnetometer map ever since Chet completed his survey. The wait is over at last and I can at least say that the cause of the anomalies is not recent, but prehistoric. We’ve already recovered numerous ceramic and stone artifacts from this area. If we aren’t completely rained out, we should know a bit more by the end of the coming week! 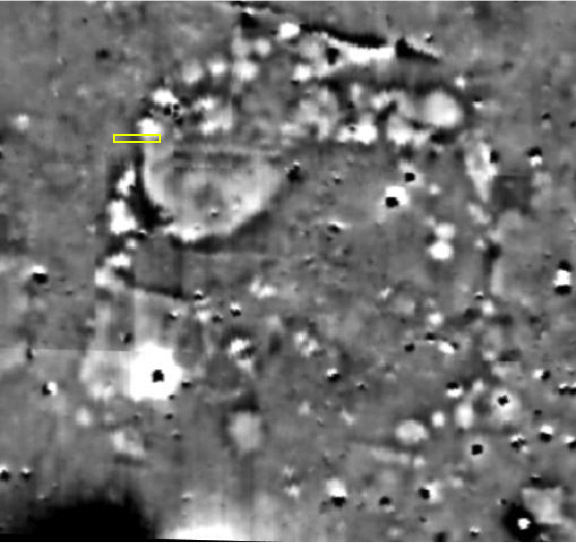 High-resolution magnetometer data from the “circular anomaly.” The imagery shows a 60-x-60 meter area of the southern plaza. We are specifically interested in the circular pattern in the northwest corner of the larger circular cluster. The yellow rectangle shows the approximate location of our 1-x-4 meter unit. Team 4’s trench over the west edge of what may be a large circular arrangement. Note the wide, curving, dark swath of soil in the lower part of the photo. When we aren’t present, our excavation units are covered with plastic tarps to keep them dry. 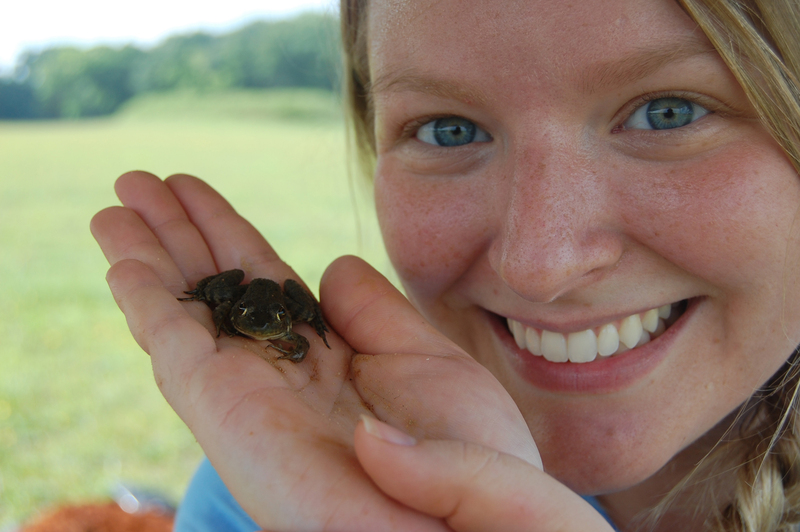 Rains transform the covered units into temporary havens for water-loving critters, especially frogs. Traci Roller happily fetches these before returning them to nearby borrow pits. Jera, Your “pit house” is known in the literature as a “basin house”. The form evolves in the American Bottom. Hundreds of them have been excavated at Cahokia and the surrounding area. Very interesting and thanks for the correction! I wasn’t exactly sure what to call them, as they aren’t well known at Moundville.